Now that the fall semester is coming to an end, the holidays are rapidly approaching. After a long couple of weeks of studying, it’s time to unwind for a bit and enjoy time with family and loved ones. What better way to do so than in a theme park? Southern California is full of entertainment such as Universal Studios Hollywood and Disneyland. Visiting these parks can give one a sense of wonder and enchantment. ELAC student Michael Ramos said, “It’s pretty nice to visit during the holidays. I especially love going to Disneyland or Universal. They make me feel like I’ve entered a different world.” Each park offers unique experiences for everyone to enjoy this holiday season. Universal Studios Hollywood has conjured some brand new magic to experience from now until January 6. 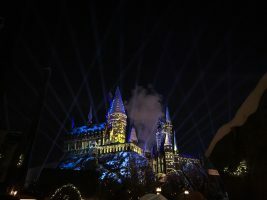 New this year, they are offering a nightly snowfall in the “Wizarding World of Harry Potter.” Now guests can experience what it truly felt like in the books with the snowfall and snow-capped buildings in Hogsmeade. Raul Cervantes, ELAC student, said, “ I enjoy the fake snow because I’ve never gotten to experience real snow before, so seeing it fake snow is pretty magical.” Another wonderful experience is the “Magic of Christmas at Hogwarts Castle.” This nightly show is . The projections on the castle are life-like and the fireworks are spectacular. USH also offers their famous “Grinchmas” celebration that just kicked off this past weekend on select nights. At “Grinchmas” you can find many of the delightful characters from the film “The Grinch Who Stole Christmas.” However, the most picturesque sight is the unique and towering 65 foot curved tree at the center of the bash. Throughout the evening, guests can participate in the Christmas tree lighting and snowfall with the Grinch and friends. Overall, USH has much to offer and is a great location for holiday fun. Perhaps the most popular destination, is the Merriest Place on Earth, Disneyland. Guests can experience the most magical time of the year here from now until January 6. I am most knowledgeable of this park because I work in Guest Relations where we are expected to provide all of the park information to our guests. At the Disneyland Resort, there are an assortment of festivities to join in on such as the Festival of Holidays which celebrates Holiday food from all around the world at California Adventure. This park also offers the show, Viva Navidad, where guests can celebrate the Latino/a culture and traditions with Mickey and friends. Over on the Disneyland side, guests can experience “A Christmas Fantasy Parade” which is filled with holiday fun and beloved Disney characters. Some rides are also transformed for the holiday season including Haunted Mansion Holiday and “it’s a small world” Holiday. Both rides take almost two weeks to transform and are a sight to behold. Disney also offers delicious holiday treats to munch on such as peppermint beignets or gingerbread churros. To end the night, Disneyland displays the “Believe in Holiday Magic Fireworks” which dazzles the night sky nightly and finishes with snowfall on Main Street USA. It is the perfect way to end the day. ELAC student Sonny Tapia recalls on his trips to the Disneyland Resort during the holiday season saying, “I love all the decorations and all of the characters’ outfits. It brings back childhood memories for me.” The Disneyland Resort is the perfect place to create memories that will last a lifetime. Visiting theme parks unfortunately comes at a price, but luckily East Los Angeles College offers discounts for students on these places so they can enjoy this holiday season. Students can become members at ticketsatwork.com and use their ELAC email address to sign up. They must use the ELAC code KBFELA at checkout to receive a student discount. It’s an incredible save for an unforgettable experience.